She is scared of her future, and ashamed of her past. She is failing herself, and knows it. She has had a long line of boyfriends, and hated them all. She detests the guy she is living with, runs away from the one she loves, and seduces the one who can never love her. But can love survive, when even the self-love dies? As I writer, I like writing about women’s issues, I feel it is important to give a voice to the countless women who suffer just because they think that what they are going through is their destiny. 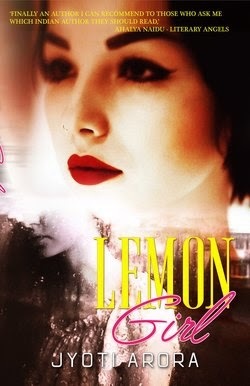 I chose to review “Lemon Girl” because I liked what was written in the blurb. The method the author has used to speak about the trials and tribulations of a young girl who punishes herself for no fault of hers....The way the protagonist deals with her own conscience and how an old memory keeps her going and believing in herself and her strengths. Jyoti Arora has written an engaging story that keeps the reader captivated till the end. The chapters in the story have been kept at a good length which helps the story flow from one page too another; there isn’t too little information and neither too much! The two main characters in the novel – Nirvi and Arsh are real; their friendship deep and their feelings for each other strong. I especially liked that way Jyoti had shown the struggle that all of us face; the fear of dealing with our own demons. The mention of Rishikesh immediately has a calming effect on the soul and that is when you know that Nirvi will now find peace and come to terms with her past. The way she discovers herself, the feelings she goes through have been expressed well by the author. Apart from Arsh, the other characters may have been briefly mentioned, but have an important part in shaping the whole story. The language used is simple and yet expresses everything well! While reading the story, I came across a few grammatical errors which stopped the flow of the story and proved to be little painful as I had to go back and reread the last sentence again to understand the context better. Maybe another round of proofreading would help keep the flow of the story intact! I also feel that the author could have used another image for the cover. Something which would have expressed the conflict that Nirvi was going through better! Of course, it goes without saying that this is a personal choice, and as it happens you can't please everyone in life :)! thanks so much for the review. I'm glad that you enjoyed the book. I am glad you liked the review :) Thank you for taking the feedback positively! Looking forward to reading more books by you.